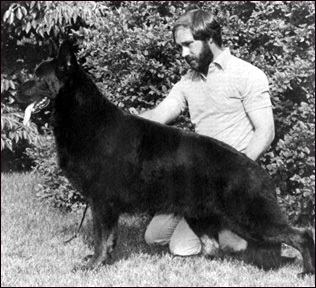 "Well proportioned solid black dog, is impressive with his masuline head, good bone and rhythmic movement." "Handsome masculine all black male who outmoved every contender. An outstanding animal in all respects." "Beautiful misculine all black male standing a real picture with the look of eagles. Ground coming gait but busy in movement, could be firmer in mid-piece."